The analysis was performed by PVS-Studio. This is a static analyzer for code written in C, C++, C#, and Java, and it runs on Windows, Linux, and macOS. I will be discussing only those bugs that looked most interesting to me. On the other hand, since the projects are pretty small, there aren’t many bugs in them anyway:). Note. The previous article about the check of FreeRDP is available here. 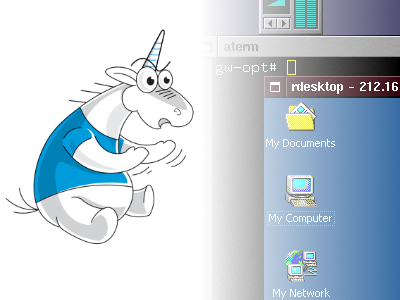 rdesktop is a free RDP client for UNIX-based systems. It can also run on Windows if built under Cygwin. rdesktop is released under GPLv3. This is a very popular client. It is used as a default client on ReactOS, and you can also find third-party graphical front-ends to go with it. The project is pretty old, though: it was released for the first time on April 4, 2001, and is 17 years old, as of this writing. The first error is found immediately in the main function: the code following the return statement was meant to free the memory allocated earlier. But this defect isn’t dangerous because all previously allocated memory will be freed by the operating system once the program terminates. The file contents are read into the buffer until EOF is reached. At the same time, this code lacks an error handling mechanism, and if something goes wrong, read will return -1 and execution will start reading beyond the bounds of the output array. This code implements incorrect EOF handling: if fgetc returns a character whose code is 0xFF, it will be interpreted as the end of file (EOF). EOF is a constant typically defined as -1. For example, in the CP1251 encoding, the last letter of the Russian alphabet is encoded as 0xFF, which corresponds to the number -1 in type char. It means that the 0xFF character, just like EOF (-1), will be interpreted as the end of file. To avoid errors like that, the result returned by the fgetc function should be stored in a variable of type int. Both variables have 0. In this case, execution moves on to the else branch: the mod_time variable will always be evaluated to 0 no matter what the next condition is. One of the variables has 0. In this case, mod_time will be assigned 0 (given that the other variable has a non-negative value) since MIN will choose the least of the two. Neither variable has 0: the minimum value is chosen. Only one or neither variable has 0: the non-zero value is chosen. Again, it looks like the problem of using the wrong operator — either || instead of && or == instead of != because the variable can’t store the values 20 and 9 at the same time. If you could follow the function to the end, you’d see that the code is OK, but it may get broken one day: just one careless change will end up with a buffer overflow since sprintf is not limited in any way, so concatenating the paths could take execution beyond the array bounds. We recommend replacing this call with snprintf (fullpath, PATH_MAX, …). The add > 0 check doesn’t make any difference as the variable will always be greater than zero because read % 4 returns the remainder, which will never be equal to 4.
xrdp — the protocol implementation. It is released under Apache 2.0. The development is based on rdesktop and FreeRDP. Originally, in order to be able to work with graphics, you would have to use a separate VNC server or a special X11 server with RDP support, X11rdp, but those became unnecessary with the release of xorgxrdp. We won’t be talking about xorgxrdp in this article. Just like the previous project, xrdp is a tiny one, consisting of about 80 KLOC. This code comes from the librfxcodec library, which implements the jpeg2000 codec to work with RemoteFX. The «red» color channel is read twice, while the «blue» channel is not read at all. Defects like this typically result from the use of copy-paste. In the genkeymap.c file, the array is declared 1 element shorter than implied by the implementation. No bug will occur, though, because the evdev-map.c file stores the correct size, so there’ll be no array overrun, which makes it a minor defect rather than a true error. The value of a variable of type unsigned short is read into a variable of type int and then checked for being negative, which is not necessary because a value read from an unsigned type into a larger type can never become negative. The not-equal checks aren’t necessary because the first check does the job. The programmer was probably going to use the || operator to filter off incorrect arguments. Today’s check didn’t reveal any critical bugs, but it did reveal a bunch of minor defects. That said, these projects, tiny as they are, are still used in many systems and, therefore, need some polishing. A small project shouldn’t necessarily have tons of bugs in it, so testing the analyzer only on small projects isn’t enough to reliably evaluate its effectiveness. This subject is discussed in more detail in the article «Feelings confirmed by numbers». The demo version of PVS-Studio is available on our website.